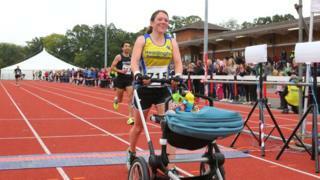 A mother is claiming a world record for running a marathon while pushing a buggy. Jessica Bruce completed the Abingdon Marathon with her seven-month-old son Daniel in a pushchair in three hours, 17 minutes and 52 seconds. Guinness World Records said the current record holder for fastest marathon pushing a pram (female) was three hours, 31 minutes and 45 seconds. Ms Bruce, from Headington, said she was awaiting confirmation from Guinness. She said: "We did so much training on hilly courses so this was easier than I expected. "We went off on an even pace and it was really good. Daniel was a star." She said she had applied to Guinness for the record and was awaiting the signature of the race director to verify her time. Ms Bruce entered the race shortly after having her son and said: "I thought I would be running slower than usual so I thought I'd set up another kind of challenge for it. "Daniel loves it, he loves watching the trees and is absolutely happy when he's awake." Her personal best in a marathon is two hours and 58 minutes and she kept running until she was seven months pregnant. Her buggy is lightweight and has in-built suspension. Guinness World Records said the current record holder was Allison Tai of Canada who set her time in September 2012 in British Columbia. The Abingdon Marathon is in its 34th year and about 1,200 runners took part.